Built-In Wi-Fi Connectivity. Lens Mount Canon EF. Canon EF-S. File Formats Still Images: JPEG, RAW. Dual Pixel CMOS AF with Live View. Other Animation. Sensor Type / Size CMOS, 22.5 x 15 mm. Dust Reduction System Yes. 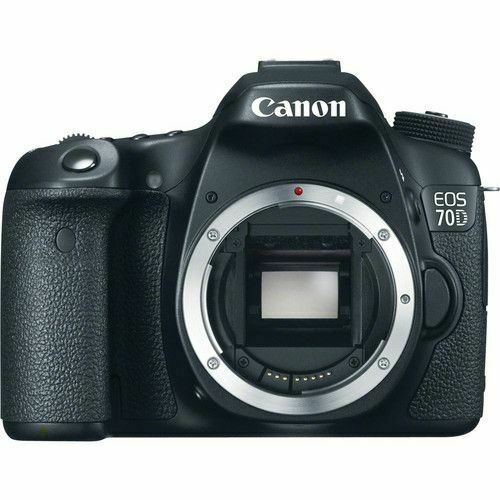 Canon EOS 70D 20.2MP Digital SLR Camera Body only. Shutter bad. For parts only. Canon EOS 70D 20.2MP Digital SLR Camera Body Black! FOR PARTS ONLY! Canon EOS 70D 20.2MP Digital SLR Camera - Black (Body Only) - Only 7009Clicks! This is my second unit of this model, since I loved the first one and decided to get one more. The camera is easy to use and quite amazing with features. It has excellent video quality and picture photo quality. I love the touch screen. The main reason I got this camera is because it has an automatic follow focus in video. It automatically follows whatever subject you touch on the screen, as the subject moves or as you move around it. If you use one of Canon's new lenses with ultra sonic motor, this focusing action will be silent. Anyhow, read the manufacturer features to see what it comes with. All I can say is that it is a fantastic camera at a great value. I do professional videos with it. Excellent camera and kit lens. This Canon 70D w/135 kit lens is a beautiful walk around/ travel/ portrait starter DSLR, which you will even keep using after moving up to a full frame (It's that Good!! )The other three lenses are only for tripod use as their weight and no "IS" render them too prone to "shaky-shots" hand held. The bag is not that bad for organizing a few accessories with the main camera. The tripod will be used for studio lights (Get the Selens, it's a GREAT compact tripod / mono-pod), The tiny tripod will obviously not hold the weight of a 70D, but can support the itty-bitty flash to fire remotely from the on camera flash (you can use your cell-phone or a postcard to deflect the "on board" flash to the "slave" All other items are well usable though. Great camera, extras not so good. This is a very capable camera that produces astounding quality of images. It's a bit of a beast, with a user's manual to match. But the results are worth the effort required to learn how to get the most out of it. I use it primarily for astro-photography, and I've been able to get some really great images of deep space objects. This is not a camera for a beginner, and neither is it the ultimate camera for the professional, but take the time to learn its capabilities and you'll love the results.